Brady Page turns upfield after a catch. 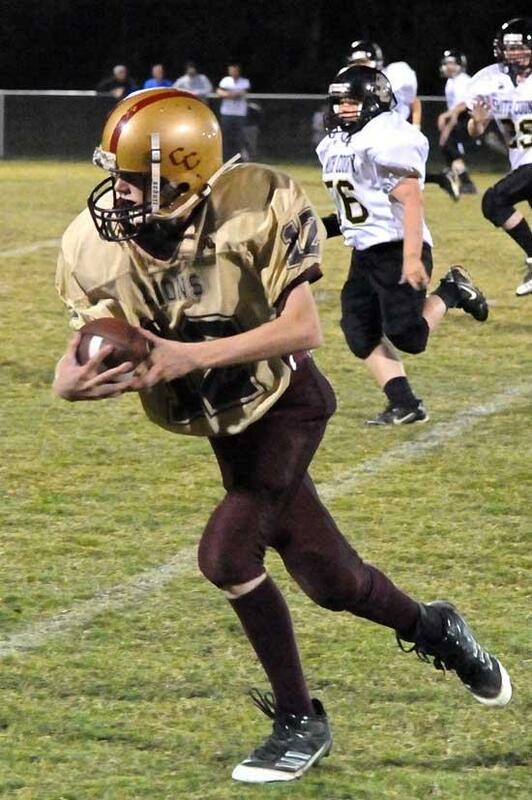 Cannon County's JR Lions enjoyed a good offensive showing in its last two games. The Lions notched their first win of the season when they turned back Red Boiling Springs, 20-6, at Schwartz Field. Colin Anderson, Bo Bryson and Julio Dominguez all scored for the winning Lions. Quarterback Bo Bryson had a strong game but primarily used his legs to help lead the win. Bryson rushed for 179 yards. Dominguez and Anderson led the receivers with 54 yards combined. "It was a good win for the players," JR Lions Head Coach Randy Farnsworth said. "They have worked hard and continued to improve so it was good to see them get a win for their effort. It was a team win. We had to have the strong defense, and we did. The offense executed well enough to control the game and the line played very well." Although the Lions were not able to get back in the win column in their next game against Smith County, they did have some bright spots. Bryson rushed for 120 yards and threw for another 103. He also had a touchdown. Dominquez rushed for 43, Brady Page had 45 yards receiving and 15 more rushing. Austin Brock hauled in a 42-yard reception. Jake Walkup had a 7-yard touchdown reception. Anthony Jackson scored on an extra point. End of the Farnsworth era?